Research with the most modern technologies confirms what old texts already claimed 5000 years ago: transcending is essential for our full development. The brain is like a muscle. When we train it, it becomes stronger, if we neglect it, it will shrink. We only use a small part of our brain potential as we evidently forgot how to train our brain and increase its capacity. That training is transcending. 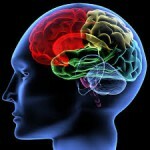 Every experience we encounter stimulates a part of our brain. When we see something, the neurons in our visual cortex start making all kinds of connections and thereby as a network increase in strength. But if we only have local experiences (for example, we see what’s inside the room, but not what’s outside of it), we only use a local part of our brain. Other parts are not stimulated, fail to make the requisite connections, and as a result the neurons start to die. But there are even more interesting ways of measuring what happens in the brain, without expensive medical scanners, but with a normal laptop, through EEG-coherence measurements. 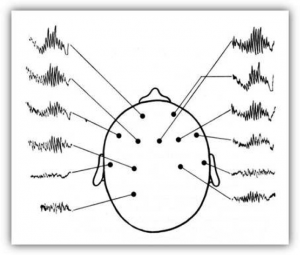 Every time a part of the brain is active, there is an electrical activity that can be measured with an electroencephalogram (EEG), an instrument visualizing information as waves. The EEG waves of different parts of the brain are then sent to a computer that (in real time) calculates the extent to which different waves overlap (= display coherence). If the brain waves are fully coherent, then this implies that the different parts of the brain are connected to each other. They function as one whole. During normal activities this coherence is quite low, somewhere between 30 and 40%. During transcending, however, the mind experiences a state of unity, and this has an immediate, measurable impact on the brain which starts working as a more unified whole. Below video shows in real-time how this process takes place. By regularly experiencing unity, we stimulate the brain to more complete growth. This graph shows the evolution of the average EEG values of 50 students over the course of 12 months. It shows that there is no difference between EEG coherence during TM exercises for someone practicing it for 2 months as compared to someone who practices it for 12 months. Transcending is not something you improve in with practice. As it is a fully natural process, one will already transcend from the first time. We do however see a difference during the activity outside of the TM exercises: the increased EEG coherence becomes more stabilised. Such increased EEG coherence can only be obtained when one really experiences transcending, the real experience of unity which influences the brain. Normal relaxation won’t do much to increase EEG coherence. 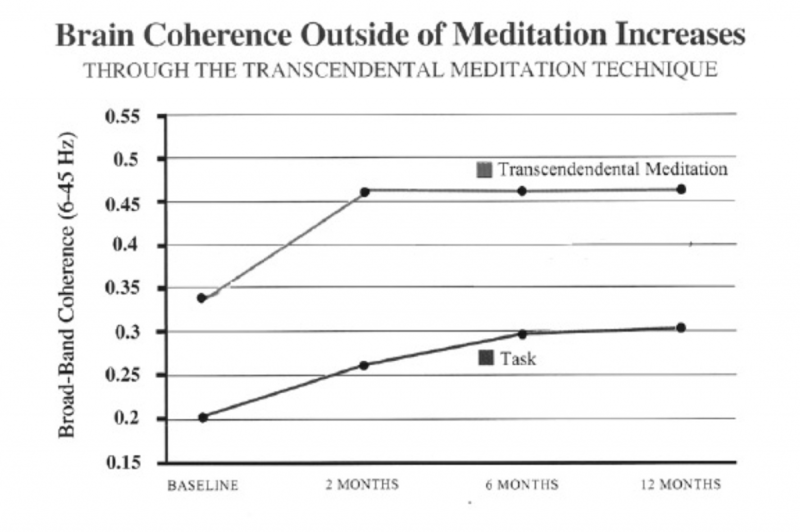 This is why the TM technique has a much stronger effect on improved intelligence, creativity and school performance than other forms of meditation. If we were to buy a new laptop only to then find that it only works at 10% of the advertized speed, no one would accept this. Anyone would immediately walk back to the store and demand a repair or upgrade. But if no one realised the real potential of the computer, and everyone’s laptop worked at more or less the same slow speed, then that same 10% would be considered “normal”. Throughout the centuries, teachers have appeared that “advertised” the real potential of humanity, and sometimes also offered examples of the real possibilities of the human nervous system, but the practical technique to obtain this result was often lost. Maharishi has always said that Transcendental Meditation is nothing new, and that it can be found in the scriptures of old cultures. He just rediscovered the practical method and turned it into a systematic technique. 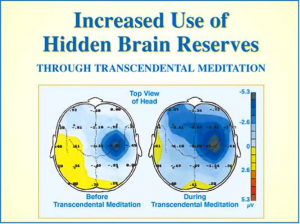 All benefits of the Transcendental Meditation technique can be found on this site, improved health, being more in touch with oneself, improved relationships, improved intelligence, more personal and professional success, are all side-benefits of what is really taking place, growth towards the development of our full potential, growth to a state of life in which the qualities of transcendental consciousness (rest, peace, happiness, love, infinite creativity and intelligence, to be connected) are permanently present in everyday life. This is a state described by Maharishi as “invincibility” (see in contact with our higher self).